WITH HIS GOOD LOOKS he couldn’t be cast for anything but swashbuckling roles. But a swashbuckler has to indulge in violence. And for 6 ft. 2 ins. London-born Roger Moore violence is something he abhors. So when he decided to make a third bid at achieving an international television reputation what probably attracted him most to the title role in The Saint series was that here was a part in which he had to use quick wits in place of guns; stealth and shrewdness instead of fisticuffs. For Leslie Charteris’s famous character is a past-master at getting himself into dangerous situations with the greatest of ease — and getting out of them, thanks to cool thinking and cunning — even audacious talking. Playing such a character is heaven-sent for Roger Moore. 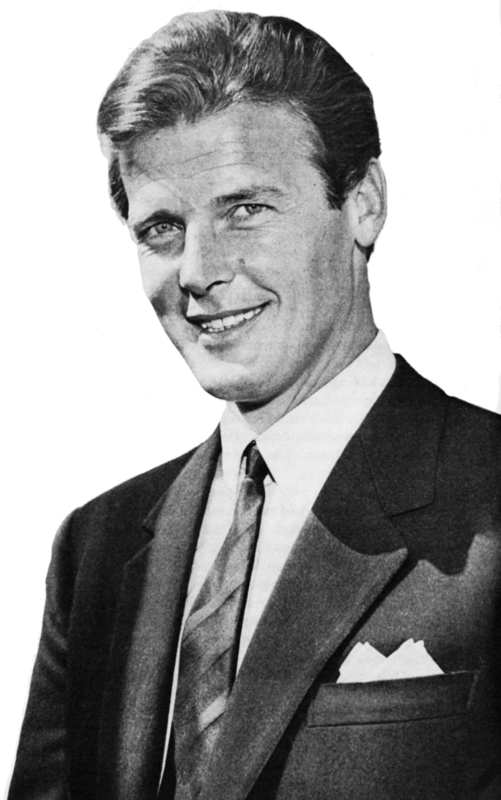 Roger Moore, the perfect Saint. Third time is different. For someone who likes well-cut suits, ties that are at the height of fashion, and comfortable — mostly suede — bootees, the wardrobe chosen for The Saint is right up Roger Moore’s street. He’s honest about this: he likes good, expensive clothes. — but not enough. He turned his eyes West — towards America, and Hollywood. Within months his £20 a week British pay packet had risen to £120. In the film capital he was to make his name in such pictures as The Miracle, The Sins of Rachel Cade and Gold of The Seven Saints. Roger Moore pictured with glamorous Shirley Eaton. He was also to earn the reputation of being one of the film capital’s best-dressed men. And Hollywood publicity writers were toying with such phrases as ‘the successor to Errol Flynn’. Roger secretly liked the tag; still does. But if he was being likened to Flynn, so he must allow himself to be considered for the hell-raising type of role which made the boisterous fighting Flynn famous. But Roger Moore just doesn’t have the luck of the Irish to protect him when he is around a fight — even one staged in a film studio, or on location in front of a camera. Bad luck seemed to dog him every time he walked into a film studio, where the word ‘action’ has more than one significance. In Ivanhoe his luck was right out. In one episode of this series, when he clashed with a knight, an over-enthusiastic serf slashed his hand with a sword. When Roger broke off the fight to examine his wounds the knight crowned him with a battle-axe. Roger landed among the horse’s hooves. He was carried off the set unconscious. In a jousting scene he cracked three ribs because ‘someone was careless with a lance’. He was also kicked by a horse. In Maverick he had a round of knocks, bruises, cuts and sores — the result of over-enthusiastic and or under-rehearsed fights in bar-room scenes, open-prairie chases, rooftop pursuits. Little wonder that the smooth and sophisticated roles which he had played with some of screenland’s most famous first ladies — Liz Taylor, Lana Turner, Hazel Court among them — is more to his liking. In The Saint this favourite Moore formula is basically available. The dialogue is crisp and intelligent. There are more than sufficient attractive young actresses—with good acting qualities as well as good looks—to offset his fetching mid-Atlantic accent and essentially English type features. And the whole character of ‘The Saint’ relies on speed of mind and tongue rather than endless brawls and feats of great physical courage. The ATV Television Showbook was published in 1962 by Television Products Limited on behalf of Associated TeleVision, which provided the Monday-Friday programmes on ITV in the Midlands and the Saturday and Sunday programmes in London, and ITC, ATV's international television arm which made programmes for ITV designed to sell abroad.